Today was a beautiful hot sunny day, just the way we like in the Okanagan. The idea of a Thai inspired chicken salad felt like the ideal dinner item – fresh, crunchy, tasty and not too heavy. You could just as easily substitute the chicken with tofu or any seafood item – delicious either way. 1 jalapeno seeded and diced finely (optional) To make the sauce combine green tea, peanut butter, soy sauce, vinegar, brown sugar, Thai sweet chili sauce, Thai red curry paste and peanut oil in a blender or food processor. Add sesame seeds, chili garlic sauce, sesame oil, ginger, garlic and 1/2 tsp kosher salt – blend well until creamy and smooth. TASTE and adjust for seasoning – you should have lots of flavour, but also really well balanced – I find depending on the type of soy sauce, chili sauce or even the lime you will have to work with those flavours. Using a meat mallet pound chicken breasts to an even thickness. Pour just enough of the dressing over to coat well and marinate for at least an hour and preferably overnight. Discard marinade used for the chicken. Grill just until cooked through and thinly slice. Prepare salad with lettuce, cilantro and vegetables – as well as the diced jalapeno if using. Cook noodles just until tender, rinse well to cool and dress with a bit of the same dressing the chicken is marinating in. Toast peanuts and sesame seeds to use as garnish. 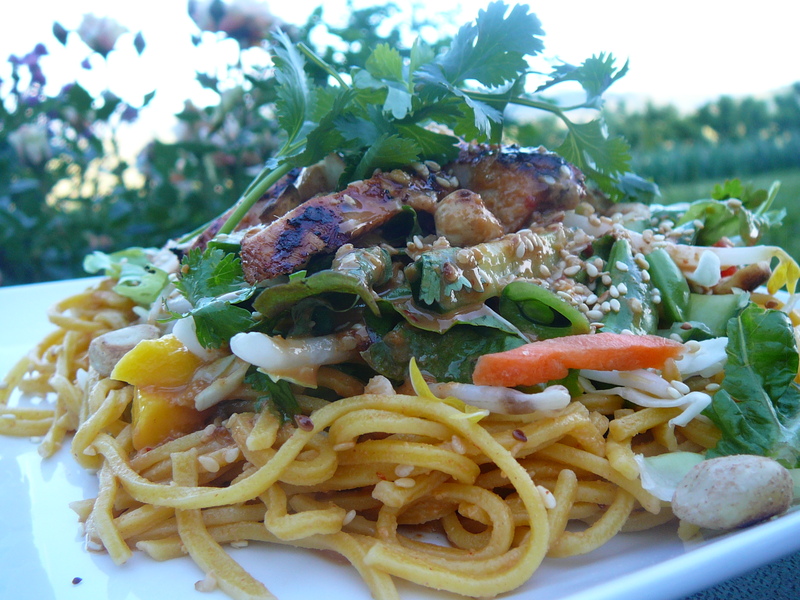 To assemble pile noodles on a plate, salad on top – scatter chicken over and drizzle with dressing. Garnish with more cilantro, peanuts and sesame seeds.